Maybe it's because I am currently in a little bit of personal limbo myself awaiting immigration papers to come through for the next adventure, but this peculiar little indie effort is far more compelling than you might think. What is it you ask? 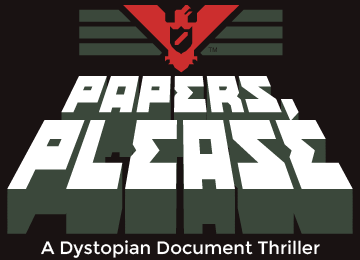 Well, Papers, Please is essentially a paperwork simulator ... no really, you heard that right, but let me explain because it's way more awesome than that might sound. In this retro styled indie title you play the role of a soviet era border guard working the immigration post between two previously warring fictional nations. Your job is to process people trying to cross the border. Check their documents, question them, find discrepancies, even search and detain them as you see fit, all against the backdrop of constantly shifting orders from the central bureaucracy. You have accept or deny everyone who passes through your booth ... and hey, it's fun to get to angrily stamp a big red 'DENIED' as revenge for every memory you have of suffering petty bureaucracy right? It doesn't sound all that exciting does it? However the game does a masterful job of making it interesting. The pace is just about perfect, as you need to process people to earn wages to pay for your family. The paperwork needs to be in order, and the game-play revolves around a kind of 'spot the difference' type challenge of spotting the possible discrepancies in their paperwork and stories. Take too long and you will soon have cold, hungry and ill family members in need of care, that will eventually die if you don't do a good job for your glorious nation! It adds a pressure to do well, and keep a challenging pace. You have a lot to keep track of, and limited time to spot the threats. That alone makes for a reasonably satisfying puzzler. Then the icing on the top is the character of the game itself. It has a dry somber sense of humor, but it is there if you like your comedy pitch black. The 'story' encounters make things interesting as it starts to tell a story of the conflict it is set against, and conspiracies start to appear. You find yourself wanting to scrape through each day in order to see what happens next. In many ways it really shouldn't work, but it does, and hey, for ten bucks on Steam it's well worth checking out.